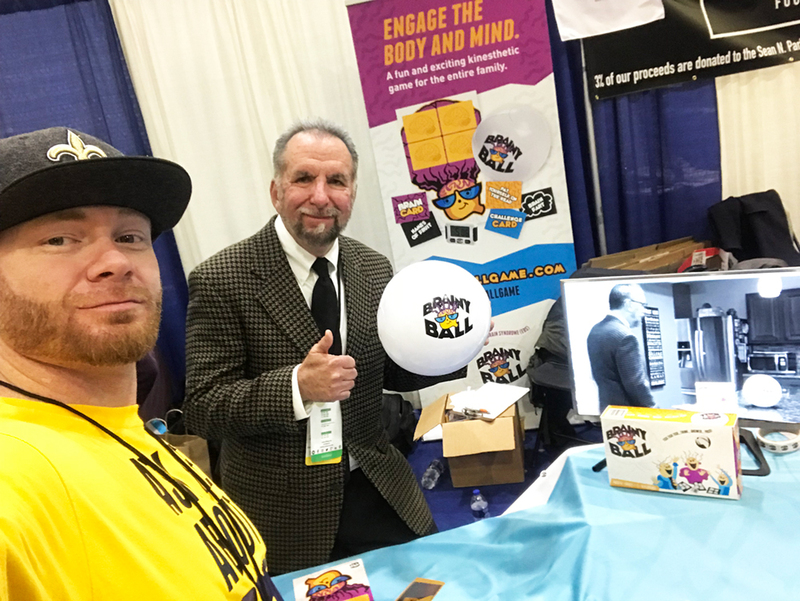 First time running your own trade show booth, and don’t know where to begin? Here are the do’s and don’ts to follow – paralleled with some recent ocreations examples. 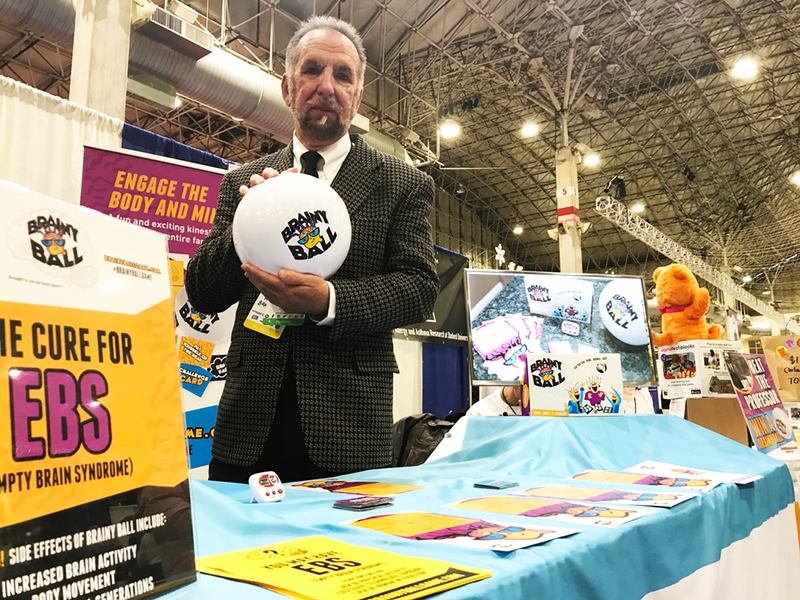 ocreations recently developed trade show items for a new client, Brainy Ball, who premiered their game at the Chicago Toy and Game Week. ocreations even attended the show as part of the client’s team. Let’s get your (trade) show on the road! Many events encourage you to register early, and sometimes even offer discounts for those who register by a certain date. There are many benefits of registering early. For starters, you’ve completed the first step in booking your first trade show. You now have more time to get started on planning for the event (booth design, ordering hardware, prepping apparel, etc.). Registering early gets your first trade show off to an organized start. As an event gets closer, things may change (times, dates, booth numbers, etc.). Coordinators putting on the event will often send instructions for all registered trade show attendees, so keep your eyes out for any emails to make sure you’re up-to-date. Check your spam folder, too – sometimes emails can find their way into folders they shouldn’t be in! In order to make sure you have everything you need, and at a great quality, you’re going to want to give yourself more time than you think. Ordering hardware, getting design work done, and getting materials printed can be more time consuming than you think. Set goals a couple days earlier (maybe even a week earlier) than you anticipate is necessary – you need to plan for things to not go according to plan. It’s always better to over-prepare yourself and have everything ready to go before you think you need it. Once you find out what your booth number is, start advertising it. 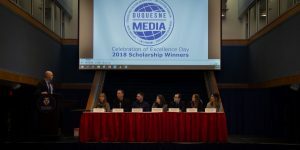 Make flyers, post on social media, send out emails. Get the word out about where people can find you. 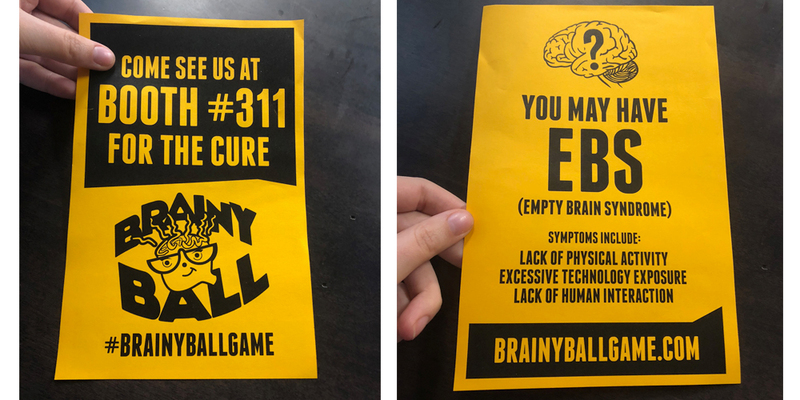 For Brainy Ball’s booth, ocreations designed a simple flyer to hand out at the event, so people knew which booth the game was at. Trade shows can be expensive, so make sure you spend the proper amount to make a noticeable booth. It’s one of the most important things you can do to prepare for a trade show. At a minimum, you’ll need a table cloth and pull-up banners to set the scene. 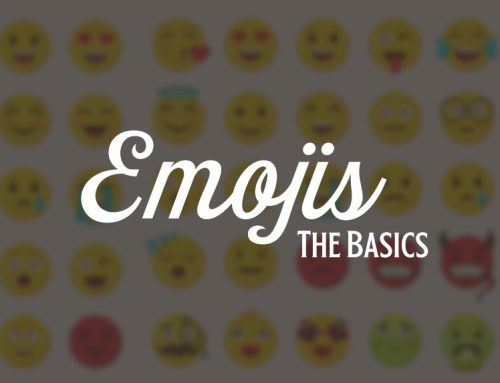 You’ll want these items to really pop and show what your brand stands for. In a previous blog, we provided advice to use the five senses while developing your booth by adding elements of sight, sound, smell, taste, and touch. The Brainy Ball booth used elements of sight, sound and touch. 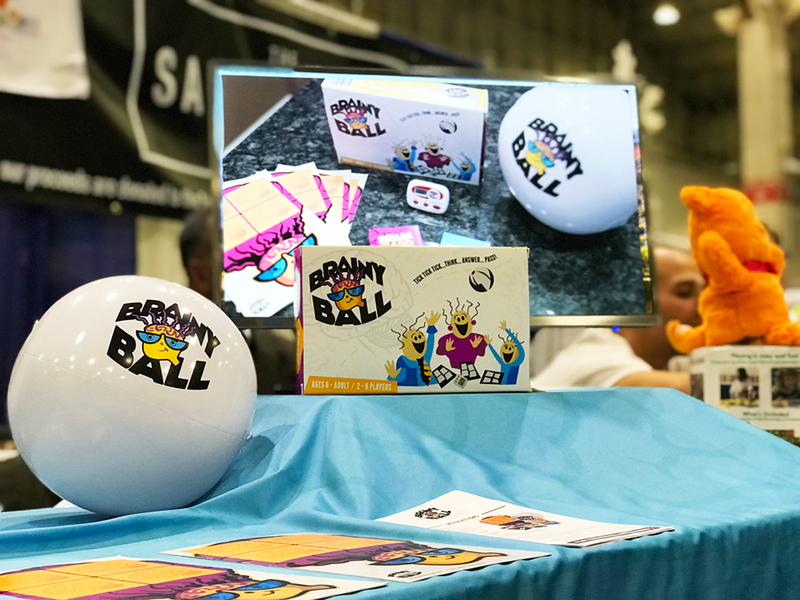 All of Brainy Ball’s booth displays had an exciting visual appeal, using the brand’s bright colors, bold typography, and fun phrases and images. Sight and sound elements were also used by displaying the game’s commercial on a monitor at the booth. The Brainy Ball booth also had sample inflatable Brainy balls for people to try out the game with the game’s creator. The best way to get people to come to your booth is to have some sort of interactive element. You want people to learn more about your brand by engaging with it. Set up a game, a questionnaire, a demo, contest, etc. to give people a glimpse of your product or service. 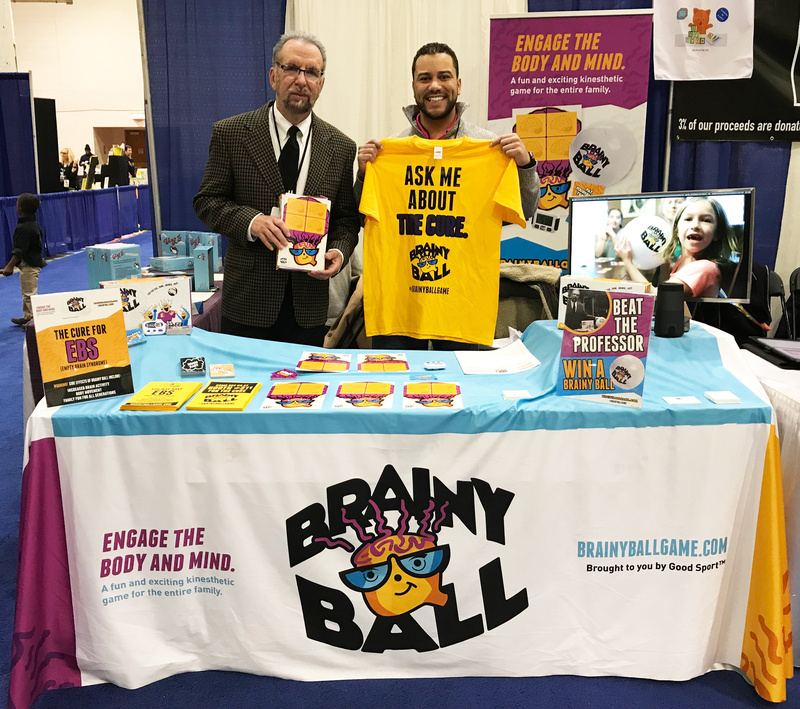 Since Brainy Ball is a game, and attended a gaming convention, the Brainy Ball team played a round of the game with anyone who came to the booth. The game itself is highly interactive (requires throwing/catching an inflatable ball), which made for the perfect trade show interactive element. So many event-goers played the game to see who could “beat the professor”. Does your company have branded clothing? Or at least certain colors in the logo that speak to the brand? Make sure your team at the trade show dresses cohesively. This demonstrates that your brand is professional and put together. At the Chicago Game and Toy Week convention, ocreations designed t-shirts for the Brainy Ball team to wear. The game’s theme is curing EBS (empty brain syndrome), so the shirts highlighted this thematic element. EBS is a made-up ailment, so it piqued a lot of trade show-goers’ attention. Besides strategizing about your own booth and how it will look, a lot of other strategic plans should be taken into consideration. Who else will be at the trade show? Will any of your competitors be there? Any potential clients you’d like to pitch to? Where will the other trade show booth attendees be located? How do you want to sell your product or service? When you go to a trade show, you should always have the goal of getting potential customers’ information to reach out after the show. 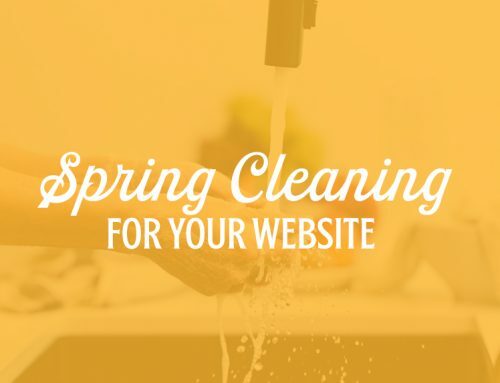 Usually, companies like to collect email addresses, phone numbers, and names. Companies do this in all sorts of ways, depending on what kind of company they are and what their goal is. For instance, Brainy Ball was interested in selling their game to customers, who got on an “exclusive waitlist” to be one of the first people get the brand new game. People come to a trade show for a reason – to see what everyone’s booths have to offer. Depending on the show you go to, there could be hundreds of booths. This can be overwhelming to the visitors. The nicer and more welcoming you are, the more inclined people will be to visit your booth. Have an enticing “pick-up” line, an activity, selling point, demo, or freebie to real people in. Trade shows can be long and tiring. However, as soon as you walk into the trade show, you have to remember to put on a smile and become the enthusiastic salesperson you never thought you could be. Trade shows rely heavily on face-to-face communication, so make sure you’re always looking upbeat and positive. It exemplifies a positive brand image. Some booth visitors may not be interested in what you have to offer. You can’t let that get you down, because the next booth visitor could be your top sale of the day. Leave the complaints and negative energy for after the show is over. It is important to stay at your booth and not leave it abandoned, but it is also important to go look around at the other booths at the trade show you’re attending. If you’re clinging to your booth, you’re missing out on opportunities to network with potential customers. 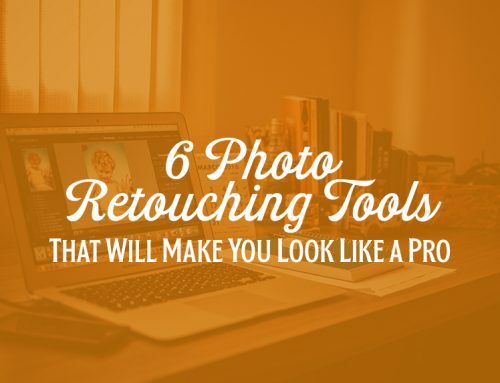 You’re also missing out on scoping out your competition. If this is your first trade show, you’ll definitely want to go do some research and see what other people are doing. It’s a great way to reflect on your own booth to see what you did well, what you could do differently, and what you could improve upon. It is so important that your booth is welcoming and approachable. Doing things like looking down, answering emails, working on something else, etc. give off the vibe that you’re not interested in being at this trade show. People don’t want to come up and talk to someone who looks busy or uninterested. Though trade shows can be tiring and busy, find time to step away to eat food, use the restroom, and quickly recharge for the rest of the show. Don’t sit and eat your lunch (not even chew gum) while trying to sell your product or service to potential customers. It’s nearly impossible to run a trade show booth by yourself. Having at least one or two other people to come help out for a trade show will be one of the best decisions you make. That way you don’t have to set up your booth by yourself or sell your product/service by yourself. You’ll have someone to grab extra copies of flyers, or grab the plug you forgot in your hotel room for the monitor at your table. Even taking shifts for lunch breaks is easier with just one extra person. Don’t underestimate the power of the trade show. Depending on what show you go to, you could be manning a both for a weekend, a few days, even a week! Your booth may require a lot of standing (bring a chair to rest behind the scenes), and will definitely require a lot of talking. Trade shows can be exhausting both physically and mentally. 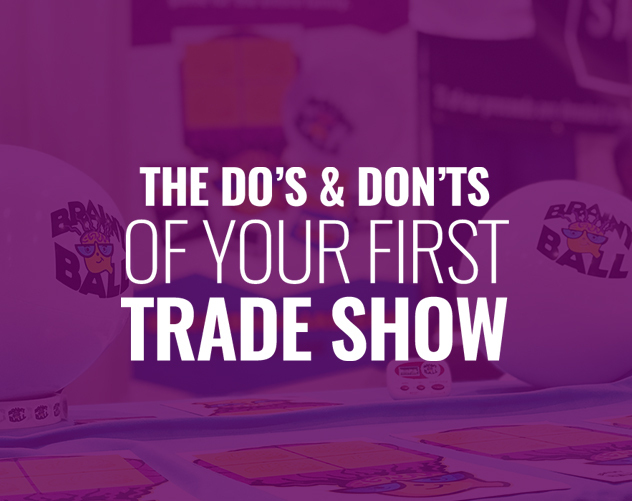 Don’t overexert yourself on the first day if you’re at a week-long trade show. Bring water, snacks, back-up supplies, and extras of everything – you’ll thank yourself later. Going to your first trade show and feel overwhelmed by how much planning and strategizing goes into it? Let us help relieve your stress. 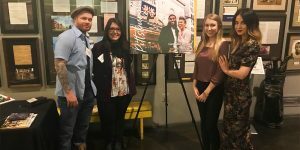 Our design team at ocreations loves to prepare clients for trade shows – especially their first one ever! Check out some other tradeshow materials we’ve worked on. Let’s get creative. Let’s get your (trade)show on the road!